We have created Africa’s first Cachaça (kuh-shah-suh) and distill it using the traditional Brazilian process. Cachaça is a distilled spirit made from sugar cane, first invented by Portuguese settlers in Brazil. The major difference between cachaça and rum is that rum is usually made from molasses, a by-product from sugar refineries, while cachaça is made from fresh sugarcane juice that is fermented and distilled. Today it’s the most popular distilled alcohol in Brazil, and has become a symbol of freedom and Brazilian identity. Agua Zulu Cachaça (43% ABV) is delicious sipped neat and works beautifully in traditional Brazilian Caipirinha and other cocktails. It is crafted in small batches in our copper pot, using high quality KwaZulu-Natal sugar cane for a uniquely Durban flavour. The sugar cane juice used for Água Zulu Cachaça is pressed and fermented within 24 hours of harvesting to ensure that it retains the freshness of the sugar cane from which it is crafted. 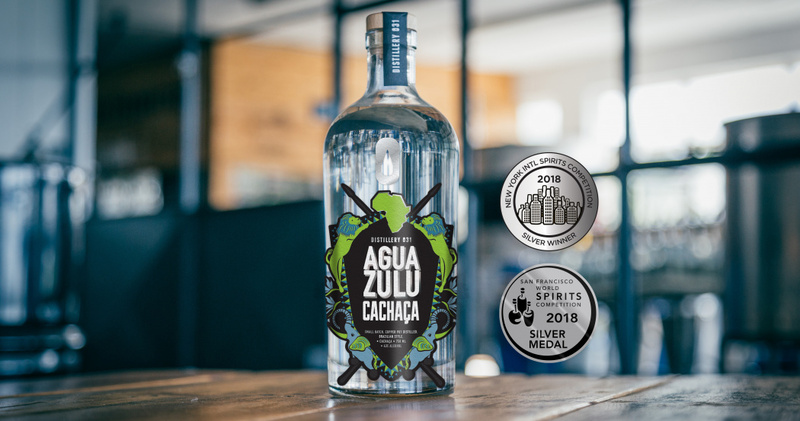 The name Agua Zulu comes from the Portuguese word “Água” which means water and Zulu referring to the Zululand region where the sugar cane is grown that Distillery 031 uses in its Cachaça.